I had this conversation with a co-worker. Thought it was funny. I guess the conversation could be labeled "How do you know when you've encountered a redneck." Rednecks are everywhere. In every state, no matter where you are. How do you know if you see one? How long have you lived in the South? Well, you should know by now when you encounter one. What is different about them? Is it their demeanor? Do they not like to do nice things, like go to a Gala? It's a nice, fancy dinner, usually pretty expensive. Well, that depends, are you buying? Because a redneck will go to that if you are taking him, but won't on his own. Usually, they will be at the nearest Golden Corral, because to them, food is food, and they don't need things to be all fancy. Basically, it's one of the weirdest conversation of my life. Try to describe a redneck. When you live in the south. I have also began trying to find solutions to my snoring. 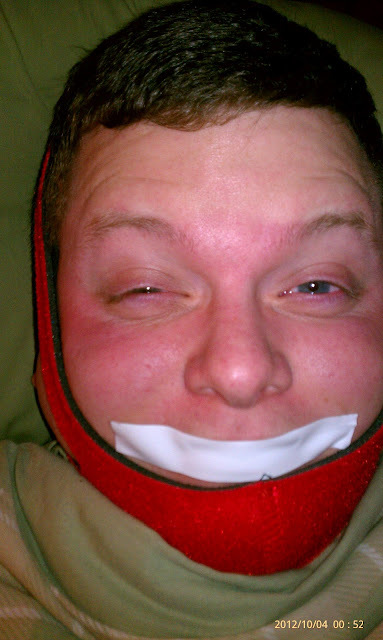 Here is a picture to demonstrate, with my face bra and electrical tape.